The first redesigned 2009 Lincoln penny in 50 years was launched on Feb. 12. The design remembers and portrays Lincoln's early life and humble beginnings in Kentucky from the years 1809-1816. 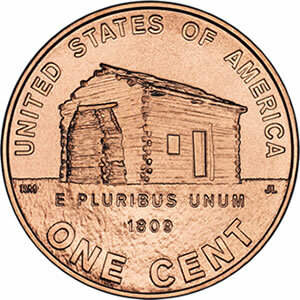 The 2009 Lincoln Penny, or "cent" features the log cabin design symbolic of Abraham Lincoln's birthplace and childhood. Inscriptions on the reverse or tails side of the coin include the UNITED STATES OF AMERICA, E PLURIBUS UNUM and ONE CENT, as well as the inscription 1809, the year President Lincoln was born. The coin was designed by United States Mint Artistic Infusion Program Master Designer Richard Masters and sculpted by United States Mint Sculptor-Engraver Jim Licaretz. Abraham was born on February 12, 1809, in a small log cabin at a place called Sinking Spring Farm in rural Kentucky, to Thomas and Nancy Lincoln. They took his name after his paternal grandfather. This humble start in life would also mark the first time that a future President would be born outside the original 13 colonies. "The place on Knob Creek… I remember very well." These developmental years would find Abraham growing bigger and stronger, and required to do chores around the farm, as any boy of his age would do. These included chopping firewood and carrying water. He was also known to deliver meals to his father who was working at a nearby distillery, sometimes staying to do odd jobs. The ownership of the land they were living on was called into question, and rather than waiting on the legal results, Thomas left with the intention of finding land that no one else could claim as theirs. Depicts a log cabin that represents Lincoln's humble beginnings in Kentucky.